The world of sales involves hustling around, talking to clients on the phone, then driving to the next conference, business or meeting to boost sales numbers. It’s a perfect life for some, yet something was missing: A mobile order management app with real time sales updates, customer lists and order statuses. Luckily, iBuildApp has recently released a handy mobile order management app to solve all of those problems. Not only does it work for both physical products and services, but it streamlines communications between sales people, since everyone can see what’s going on with each of the customers. When a sales team isn’t on the same page it ticks off customers, causes lost sales and potentially damages the company. Therefore, we invite you to check out the order management app to see if it’s right for your business. 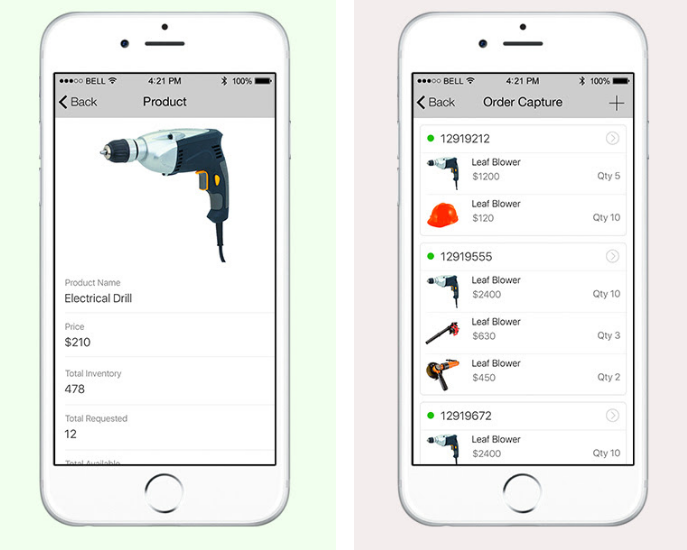 What Can You Do With the New Order Management App from iBuildApp? The app was built leveraging features like spreadsheet formulas, table references, app formulas and conditional formatting. This opens up several features for salespeople managing orders, whether they be for services or products. For example, a saleswoman can open a page for a new customer, placing that customer on a list of all of your buyers. Contact information resides on the customer page, for calling, emailing or texting the person right from your app. In addition, you can see a list of all the orders from said customer. What’s the Status of This Order? Part of being a salesperson is knowing where you are in the sales process with a customer. With dozens of clients, it’s tough to remember if an order was cancelled or completed. Therefore, you can examine the order status (Open, Complete or Cancelled,) and change the order status after talking with the customer. 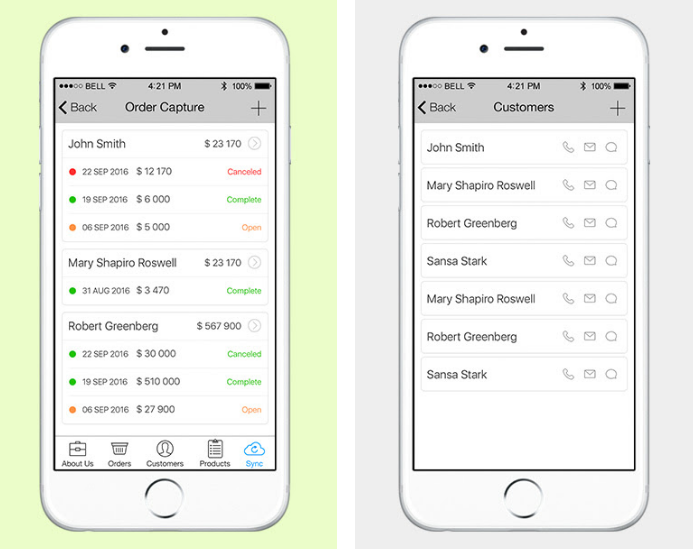 The order management app provides real time visibility into all of your customer purchases. Let’s say you’re chatting with a buyer who is already in the process of ordering a batch of products from you. It’s not uncommon for them to realize that they might need more units, or that they’re also interested in a different product. Therefore, the app lets you add additional product items into the current order, along with details like pricing. Oh yeah, if you’re not sure about how much inventory is left, the app tells you that as well. 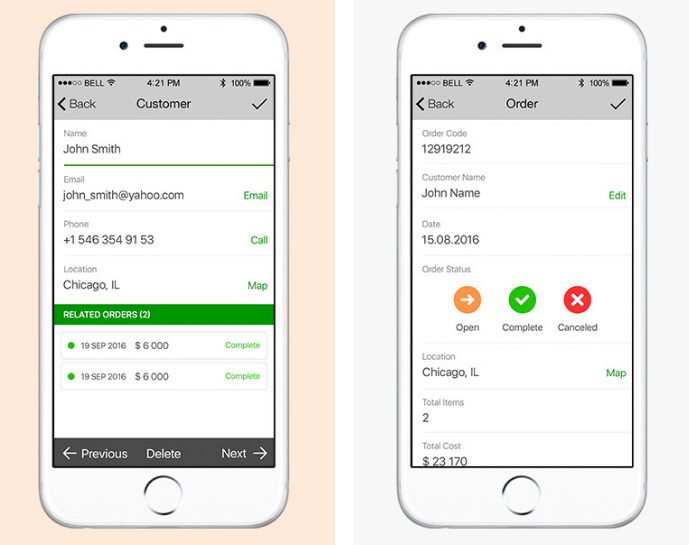 Start by going to the mobile order management app page. A button is available for getting the app and joining the waitlist. Keep in mind that this is a complete app, eliminating the need for any coding. Therefore, you can launch it for your sales team right off the bat and streamline your admin and business processes. Once a customer places an order you see a drop-down menu with all of your customers listed. The customer list can be edited, and it’s constantly updated so that all salespeople have the most recent list. If a salesperson opens a customer page with details, they can then add a new order for that particular customer. The app syncs with a Google Spreadsheet for additional formulas and calculations. For example, you can view an order total based on a synced formula with Google Sheets. Now that you’ve had a chance to review all of the app’s features, feel free to go to the product page to test out the demo and sign up for the waiting list. If you have any further questions about the app, feel free to let us know in the comments section below.